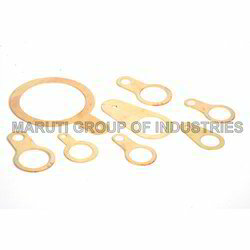 Manufacturer of a wide range of products which include cable gland earthing tag. We are a promising business organization, which is engaged in manufacturing, supplying and exporting optimum quality Cable Gland Earthing Tag. Manufactured as per the set norms of industry, these tags are developed by our professionals who hold vast experience in this domain. Furthermore, we check these products on strict parameters on the basis of high strength and abrasion resistance properties. Looking for Cable Gland Earthing Tag ?